Lightly blackened shrimp pan roasted in herb butter served with bleu cheese dipping sauce. Crispy skins topped with our slow roasted pulled pork, cheddar cheese, and scallions served with sour cream. Breaded chicken tenders tossed in homemade buffalo wing sauce served with a bleu cheese dipping sauce. Crispy breaded large rings with Lucille's special dipping sauce. With mesquite ranch and marshmallow sauce for dipping. Topped with applewood bacon, cheddar cheese and scallions served with sour cream on the side. Lucille's signature soup, topped with cheddar cheese and scallions. All the way with shredded cheddar, scallions and tortilla chips. Our signature soup - Added to the menu due to popular demand!! Fresh spinach with diced tomatoes, diced cucumbers, diced onions, goat cheese, and lightly blackened shrimp tossed in our homemade red wine vinaigrette dressing. Mixed greens, cucumbers, kalamata olives, tomatoes, pepperoncini, feta cheese and red onions tossed in oregano vinaigrette. Crisp mixed greens with tomatoes, red onions, cucumbers and herb croutons with choice of dressing. Half head of iceberg lettuce with gorgonzola cheese, applewood smoked bacon and bleu cheese dressing. Traditional dressing with romaine lettuce, homemade croutons and parmesan. A good friend of Lucille's made this salad for a luncheon and card party, and Lucille picked up the recipe and added it to her menu. Many of her regular customers come in just for this very salad. Battered buttermilk chicken tenders, cheddar cheese, crispy noodles, bacon, tomatoes, scallions and mixed greens tossed with honey-barbeque sauce. Try it yourself and see why it has become such a favorite. Mixed greens, tomatoes, cucumbers, red onion, sliced mushrooms, Mandarin oranges and tortilla strips, tossed in mesquite ranch dressing with blackened chicken and avocado. Mixed greens with tomatoes, scallions and bleu cheese crumbles tossed in ranch dressing and topped with buttermilk tenders in spicy buffalo wing sauce. Fresh spinach, romaine lettuce, topped with aged goat cheese, sundried cranberries, pears and homemade candied walnuts tossed in red wine vinaigrette. Fresh turkey, avocado, bleu cheese, hard cooked egg, tomato and crisp bacon, over mixed greens with a choice of dressing. With mixed greens, tomatoes, candied walnuts, red onions, cucumbers, bleu cheese and bacon tossed with balsamic vinaigrette. Fresh spinach, romaine lettuce, diced tomatoes, diced cucumbers, diced red onion, sliced grilled skirt steak topped with bleu cheese crumbles served with our homemade balsamic vinaigrette dressing. Served on a toasted bun with lettuce and tomato (red onion and pickle upon request). Golden fried grouper served on a soft bun with lettuce and tomato and a side of tartar sauce. Cici's cure for boys night out - pulled pork, bacon jam, sautéed onions, american and monterey jack cheese on grilled white. 7 ounce all white meat turkey grilled and served on a toasted bun with lettuce and tomato. (red onion and pickle upon request). Served grilled or blackened with lettuce and tomato on a toasted bun with tartar sauce on the side. A classic, served on grilled rye with melted american cheese and sauteed onions. Grilled chicken, fresh avocado, applewood smoked bacon and aged swiss cheese on a soft roll with herb aioli, lettuce and tomato. Grilled chicken lightly blackened and topped with caramelized vidalia onions and French brie, served on a bun with herb aioli, lettuce and tomato. Grilled portobello mushroom, zucchini, yellow squash, roasted red pepper, and red onion marinated in fat-free vinaigrette and topped with parmesan cheese on a soft bun with herb aioli. Served with coleslaw instead of french fries. White bread & American cheese, grilled until golden brown. Topped with sour cream, diced cucumbers, salsa & chipotle aioli served on a soft bun. Tuna salad on grilled rye with melted american cheese. After any holiday, the best part for Lucille growing up was having the leftover sliced turkey with coleslaw, swiss cheese and russian dressing on grilled rye, the way Lucille's grandma made it. We do the same, but we oven-roast the turkey especially for this sandwich. Only Lucille's closest friends knew that she was sometimes called CiCi by only one man. 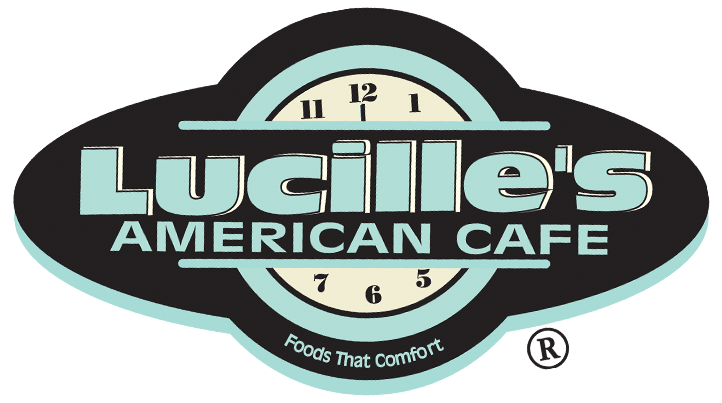 And when that special man came into the restaurant -- always late at night -- Lucille would make him a grilled cheese with melted american and monterey jack cheeses, bacon and tomato on grilled white bread. Breaded chicken tossed in buffalo sauce and topped with bleu cheese dressing on a soft bun with lettuce and tomato. Seasoned, slow-cooked pulled pork piled high on a soft bun with barbeque sauce on the side. All served with leaf lettuce, sliced tomato & steamed broccoli. Your choice Grilled or Blackened. Substitute onion rings or sweet potato sticks for fries - add $1.50. Oven roasted turkey breast, cheddar cheese, crispy bacon, lettuce and tomato with our homemade mesquite ranch served on white toast. White toast, applewood smoked bacon, lettuce, tomato and basil mayo. All white meat tuna with lettuce and tomato on whole wheat toast. Fresh turkey, ham, swiss and american cheeses, applewood smoked bacon, lettuce, tomato, basil mayo served triple-decker with honey dijon dipping sauce. AND a bowl of soup (our homemade tomato bleu cheese, chicken noodle, baked potato or soup of the day) OR small house or Caesar salad. 8 ounce marinated skirt steak grilled to perfection and topped with a housemade chimichurri sauce and served with rice pilaf and mixed vegetables. Lightly blackened shrimp pan roasted in herb butter served with rice pilaf, mixed vegetables, and bleu cheese dipping sauce. Five buttermilk tenders served over fries with homemade applesauce and your choice of honey barbeque, honey dijon, or barbeque sauce. Grilled chicken breast smothered in sauteed onions, mushrooms, Cheddar cheese and Monterey Jack cheese with rice pilaf and green beans. Brown sugar and coriander-marinated chops served with homemade applesauce and mashed potatoes. Grilled chicken breasts brushed with homemade BBQ sauce, topped with jack cheese, Applewood smoked bacon, cheddar, tomatoes & scallions served with mashed potatoes & broccoli. Breaded chicken scallopini flash fried and oven roasted with a tropical citrus beurre blanc and macadamia nut crust served with mashed potatoes and broccoli. Served with rice pilaf and a choice of vegetable (try it blackened). Lucille's love for Southern BBQ is evident in this slow-cooked classic. Piled high and served with mashed potatoes, coleslaw and home made barbeque sauce on the side. There was a time when you could not buy store-bought barbeque sauce. The very idea that barbeque would someday come in a plastic bottle is something Lucille would never have condoned. We still make our ribs the way Lucille learned from Mrs. Piot, who once came to visit and left this recipe behind, along with a lot of love for good cooking. Mushroom gravy, mashed potatoes and a choice of vegetables. All white meat chicken with potatoes, carrots, celery and peas served in a flaky crust. Herb stuffing, mashed potatoes, vegetables, homemade cranberry sauce and gravy. Bubbling hot with herb breadcrumb topping. Three flour tortillas with Cajun seared snapper, diced tomatoes, mojo slaw and chipotle aioli served with tortilla chips and chipotle salsa. With mashed potatoes, stuffing, cranberry sauce and homemade gravy. Sliced chicken breast with melted Monterey Jack cheese, chipotle aioli, sauteed onions and mushrooms on a hoagie with homemade potato chips. Slow roasted brisket sliced and basted in carolina rootbeer barbeque sauce topped with peppercorn ranch purple coleslaw on a soft roll served with potato chips. Two slices of homemade meatloaf pan roasted and topped with sauteed onions, melted Monterey Jack cheese and homemade barbeque sauce, served on a hoagie roll with herb aioli then topped with a crispy onion ring. Served with homemade potato chips. Fresh mixed greens with shredded cheddar, diced tomatoes, scallions, tortilla strips with your choice of homemade sirloin chili or blackened chicken served with ranch and chipotle salsa. As her family grew, Lucille could always "Shepherd" the family together with this mouth-watering classic. With mashed potatoes, coleslaw and homemade turkey gravy on the side. North Atlantic cod in Aunt Gertrude's classic beer recipe, served with potato planks, slaw, homemade tartar sauce and malt vinegar. Fresh salmon lightly grilled then topped with honey dijon sauce and oven roasted on cedar plank. Served with rice pilaf and mixed vegetables. Classic breaded steak smothered in homemade country sausage gravy served with mashed potatoes and mixed vegetables. Slow cooked tender roast with celery, onions and carrots in gravy made from pan drippings, served with mashed potatoes (just like grandma used to make). Additional Toppings $.50 each: Homemade Warm Chocolate Sauce, Caramel, Strawberries, Marshmallow, Peanut Butter Sauce, Crushed Reese's, Crushed Oreo Cookies, Sprinkles. Your choice of 2 big scoops of ice cream and sauce served with whipped cream, walnuts and a cherry. Ice cream choices: vanilla, chocolate, strawberry. Sauce choices: chocolate, caramel, strawberry, marshmallow. Chocolate and vanilla ice cream, peanut butter sauce, homemade chocolate sauce, chopped Reese's cups, whipped cream, and a cherry. Vanilla ice cream, homemade chocolate sauce, crushed Oreos, whipped cream and a cherry. Vanilla, strawberry and chocolate ice cream over a fresh banana, topped with strawberries, chocolate sauce, marshmallow sauce, whipped cream, chopped walnuts and a cherry. Served with Edy's ice cream. With vanilla ice cream, our homemade chocolate sauce, and whipped cream, walnuts and a cherry. It's been said that there was a time when a lady who knew General Lee paid Lucille a visit. Lucille was told that General Lee had a favorite bread pudding recipe that he carried around with him during the war between the states. This is that recipe. Served warm with vanilla ice cream and bourbon sauce. Two big scoops of your choice of ice cream mixed with seltzer and topped with real whipped cream. Chocolate syrup, seltzer, and milk. Substitute egg whites on any egg dish, add $1.00. Two eggs over easy, ham and hollandaise served on top of English muffins with brunch potatoes. Four ounce skirt steak grilled to perfection with eggs any style, homestyle potatoes and choice of toast. Two eggs, sausage, bacon or ham, Jack cheese and herb aioli served in between Texas toast, with our homestyle potatoes. Scrambled eggs, homestyle potatoes, sausage, cheddar, tomatoes, scallions and toast. Scrambled eggs with peppers, onions and cheddar cheese, topped with our homemade Texas chili, rolled in a flour tortilla and covered with cheddar cheese, roasted in the oven and served with breakfast potatoes, sour cream and salsa. Served with homestyle potatoes and toast. Substitute egg whites on any egg dish, add $1.00. Substitute bagel for toast, add $.50. Spinach, mushrooms, tomatoes, onions and peppers. Ham, bacon, sausage, and cheddar cheese. Ham, onions, tomatoes, peppers, and cheddar cheese. Cheddar cheese, American cheese, Swiss cheese, Bacon, Ham, Sausage, Spinach, Sauteed onion, Mushrooms, Peppers. Our homemade bread pudding seared on the griddle, topped with whipped cream and caramel drizzle. Three fluffy buttermilk pancakes with three golden fried chicken tenders served with maple syrup and our homemade bourbon sauce. Served with Vermont maple syrup, whipped butter and a choice of sausage or crispy bacon. One buttermilk, blueberry or chocolate chip pancake with sausage or bacon and a small drink. With sausage or bacon, toast and a small drink. With syrup, sausage or bacon and a small drink. *INDICATES ITEM HAS INGREDIENTS THAT HAVE BEEN COOKED IN A FRYER WITH BREADED (Gluten) ITEMS. with applewood smoked bacon, cheddar cheese, scallions & sour cream. with our slow roasted pulled pork, cheddar cheese, scallions served with sour cream. with cheddar cheese, scallions, and tortilla chips. Russian, Bleu Cheese, Ranch, Mesquite Ranch, Caesar, Honey Dijon, Honey BBQ, Oregano Vinaigrette, Balsamic Vinaigrette, Fat Free Basil Vinaigrette, Red Wine Vinaigrette. Mixed greens, cucumbers, olives, tomatoes, pepperoncini, feta cheese & red onions tossed in oregano vinaigrette. Mixed greens, cucumbers, tomatoes & red onions with your choice of dressing (order no croutons). Half head of iceberg w/ gorgonzola cheese, applewood smoked bacon & bleu cheese dressing. Traditional dressing with romaine & parmesan cheese (order no croutons). Fresh spinach, romaine, topped with aged goat cheese, sundried cranberries, pears and homemade candied walnuts tossed in red wine vinaigrette. Mixed greens, tomatoes, candied walnuts, red onions, cucumbers, bleu cheese and bacon tossed with balsamic vinaigrette. Mixed greens, tomatoes, cucumbers, red onion, sliced mushrooms, mandarin oranges and tortilla strips*, tossed in mesquite ranch dressing with blackened chicken and avocado. Fresh spinach, diced tomatoes, diced cucumbers, diced red onion, sliced grilled skirt steak topped with bleu cheese crumbles served with our homemade balsamic vinaigrette dressing. Request Udi's Gluten Free Whole Grain Bread. Potato Chips & French Fries have been cooked in a fryer with breaded (gluten) items - Substitute any side dish. with BBQ sauce on the side & side dish. Bacon, lettuce, tomato, basil mayo & side dish. Lettuce, tomato & side dish. American cheese & side dish. Cheddar cheese, crispy bacon, lettuce and tomato with mesquite ranch. Grilled cheese american & monterey jack cheeses, bacon & tomato. Cici's cure for boys night out- pulled pork, bacon jam, sauteed onions, american and monerey jack cheese. Fresh avocado, Applewood bacon & Swiss cheese, herb aioli, lettuce, tomato & side dish. Caramelized Vidalia onions & French brie, w/ herb aioli, lettuce, tomato & side dish. Grilled topped with chimichurri sauce served with your choice of two gluten-free sides. Sauteed onions, mushrooms, cheddar cheese and monterey jack cheese served with your choice of two gluten-free sides. Coriander marinated, served with mashed potatoes & applesauce. Barbeque sauce, with jack cheese, applewood bacon, cheddar, tomatoes & scallions served with mashed potatoes & broccoli. Served with mashed potatoes & mixed vegetables. Lightly blackened shrimp pan roasted in herb butter served with your choice of two gluten-free sides, and bleu cheese dipping sauce. Served with mashed potatoes & coleslaw. with Homemade BBQ Sauce, served with fries* & coleslaw.